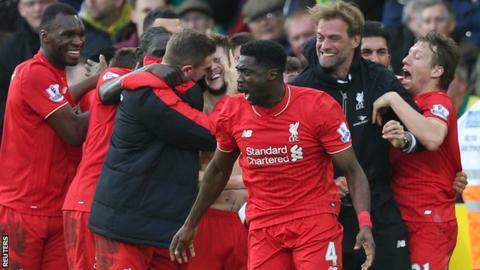 Adam Lallana's injury-time strike saw Liverpool edge a nine-goal thriller at Norwich in one of the most dramatic Premier League games of the season. Roberto Firmino scuffed the Reds ahead but Dieumerci's Mbokani's backheel levelled and Steven Naismith's debut strike put the home side in front. Wes Hoolahan added a penalty before Jordan Henderson and Firmino struck. James Milner put the away side ahead and though Sebastien Bassong netted in added time, Lallana delivered a twist. The England midfielder's volley - which was fired into the ground and bounced agonisingly in for the home side - sparked chaotic scenes as Reds boss Jurgen Klopp raced along the touchline to celebrate with his players. Just moments earlier, Klopp had been visibly incensed by his side's lapse in allowing Bassong to level - but the change in his mood was fitting in a game which ebbed and flowed like this one. The German had his glasses knocked off by striker Christian Benteke during the celebrations and later said: "I have a second pair of glasses but I can't find them. It's really difficult looking for glasses without glasses." Norwich scored their second goal attacking Liverpool's left side and won a penalty down that flank. This graphic shows the Reds made far more tackles on the right of the field, so do they need to be stronger down the left? The contrast in emotion on the touchline was as pronounced as anything the season has delivered so far and Norwich will have to recover before Tuesday's trip to Tottenham. Their record now stands at 32 Premier League games without a win in matches where they have fallen behind - but having been 3-1 up, few will sting like this. The first five shots on target in this game found the net and neither side could claim to have deserved a win, with each guilty of lapses which at times led to chaos and resulted in just the fourth 5-4 result in Premier League history. Russell Martin will feel worse than most after gifting Milner the chance to put Liverpool 4-3 up with a weak, blind backpass. And though Bassong's crisp strike from 20 yards appeared to have reprieved his fellow defender, substitute Lallana's first league goal of the season capped a frenzied finish. The Reds are four points worse off than at this stage last season but could this win be a catalyst for a spell of consistency and a move higher than seventh place? One wonders what reception Liverpool's players would have got from Klopp had it stayed 4-4, such was his demeanour, and his side masked some common inefficiencies in taking three points. Mbokani's brilliant back-heeled finish arrived after failing to clear a corner, meaning the Reds have conceded eight goals from corners this season - a league high. Their passing - at 75% accuracy - was not at its best, their defending was sometimes rash but they found key goals, despite having scored fewer times than relegation-threatened Sunderland before kick-off. Much has been made of the need to sign a striker but after such a result, neglecting their defensive issues seems a big risk for Klopp who will surely be keen to have less stressful afternoons in the dugout. "When you concede five goals you deserve to lose the game," concluded Norwich boss Alex Neil after the match. The Scot admitted defensive errors have been his side's "downfall" this season and the 43 goals they have leaked in 23 games paints a damning picture - and only Sunderland (45) have let in more. However, the performance of Naismith at the other end does offer something positive to take forward. Making his debut alongside full-back Ivo Pinto - who had a tough afternoon - Naismith showed quality throughout. He managed 18 goals in 52 league starts at Everton but may need to adopt the role of talisman rather than impact substitute at Norwich if they are to survive. That said, they have now conceded 11 goals in three games - a stat which must improve if any Naismith contribution is to prove telling. Steven Naismith has now scored his first Premier League goal for both Everton and Norwich against Liverpool. The Canaries have conceded a league-high 21 Premier League goals in the last half hour of games this season, six more than any other team. This is only the third time in Premier League history that Liverpool have recovered from two goals behind to win an away game - also against Manchester City in October 2008 and Fulham in October 2004. Norwich travel to Tottenham in the Premier League on Tuesday and Liverpool will be in action at the same time as they try to protect their 1-0 League Cup semi-final first-leg lead against Stoke City. Match ends, Norwich City 4, Liverpool 5. Second Half ends, Norwich City 4, Liverpool 5. Adam Lallana (Liverpool) is shown the yellow card for excessive celebration. Goal! Norwich City 4, Liverpool 5. Adam Lallana (Liverpool) left footed shot from the centre of the box to the bottom right corner. Attempt blocked. Steven Caulker (Liverpool) right footed shot from the centre of the box is blocked. Goal! Norwich City 4, Liverpool 4. Sebastien Bassong (Norwich City) left footed shot from outside the box to the bottom right corner. Assisted by Cameron Jerome following a set piece situation. Offside, Liverpool. James Milner tries a through ball, but Christian Benteke is caught offside. Attempt blocked. James Milner (Liverpool) right footed shot from outside the box is blocked. Assisted by Christian Benteke with a headed pass. Substitution, Liverpool. Steven Caulker replaces Alberto Moreno. Dieumerci Mbokani (Norwich City) wins a free kick in the defensive half. Attempt saved. Roberto Firmino (Liverpool) right footed shot from the left side of the box is saved in the centre of the goal. Assisted by Christian Benteke. Matthew Jarvis (Norwich City) wins a free kick in the defensive half. Substitution, Liverpool. Christian Benteke replaces Jordan Henderson. Goal! Norwich City 3, Liverpool 4. James Milner (Liverpool) right footed shot from the centre of the box to the centre of the goal. Attempt saved. Alberto Moreno (Liverpool) left footed shot from outside the box is saved in the centre of the goal. Assisted by Roberto Firmino. Corner, Liverpool. Conceded by Dieumerci Mbokani. Corner, Liverpool. Conceded by Ivo Pinto. Substitution, Norwich City. Matthew Jarvis replaces Nathan Redmond. Attempt saved. Sebastien Bassong (Norwich City) header from the centre of the box is saved in the bottom right corner. Assisted by Nathan Redmond. Ivo Pinto (Norwich City) wins a free kick on the right wing. Foul by Kolo Touré (Liverpool). Offside, Liverpool. Lucas Leiva tries a through ball, but Adam Lallana is caught offside. Kolo Touré (Liverpool) wins a free kick in the defensive half. Offside, Liverpool. Jordan Henderson tries a through ball, but Adam Lallana is caught offside. Goal! Norwich City 3, Liverpool 3. Roberto Firmino (Liverpool) right footed shot from the centre of the box to the bottom left corner. Assisted by Adam Lallana. Hand ball by Nathaniel Clyne (Liverpool). Goal! Norwich City 3, Liverpool 2. Jordan Henderson (Liverpool) right footed shot from the centre of the box to the bottom left corner. Assisted by Roberto Firmino. Goal! Norwich City 3, Liverpool 1. Wes Hoolahan (Norwich City) converts the penalty with a left footed shot to the centre of the goal. Penalty Norwich City. Steven Naismith draws a foul in the penalty area. Penalty conceded by Alberto Moreno (Liverpool) after a foul in the penalty area.